How true that is. I'm not one for trying to overly fuss about my hair. It's healthy and strong but I do hate having to tackle the frizz and I always love a little bit of shine. 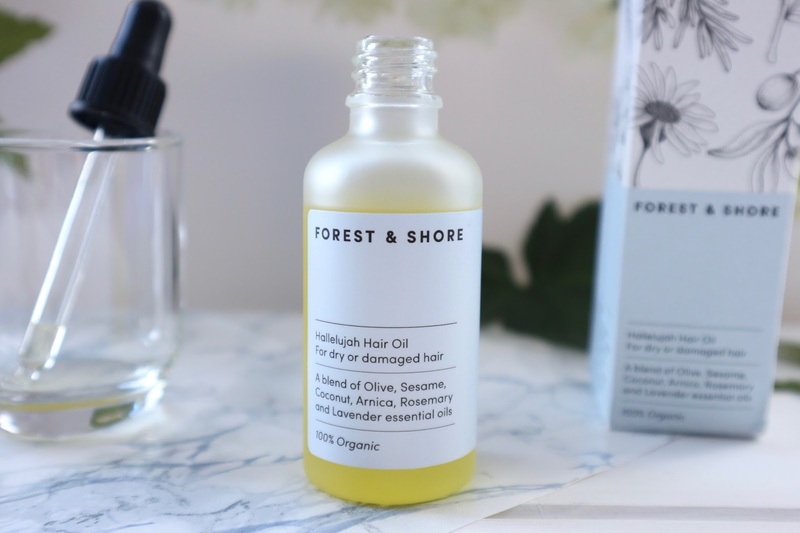 Now, you've probably all seen that a new brand has popped up - Forest & Shore and they debuted with their first products the Hallelujah Hair Oil*. I'm very lucky to have been able to test this new brand and product out. Formulated with a blend of oils including Rosemary, Coconut, Olive, Lavender and most interestingly Sesame and Arnica, the aim of the Hallelujah Hair Oil is to repair damaged hair and restore hydration and vitality to dry hair. My hair, while in pretty good condition, has been dyed a lot and after my holiday in the sun my tips are a fair bit bleached. The first thing I noticed about the oil is the beautiful scent. The dominant fragrance to come through for me is the Rosemary which is light and very calming. The second thing I noticed is that despite the combination of the oils, the final result is a very light oil, a rich yellow in colour but lightweight and quite delicate. I always worry that oils will be too heavy on my hair and make it greasy and leave an unpleasant residue, however the delicate nature of the Hallelujah Hair Oil means that it is quite the opposite. The usage guidance is to use 2-5 drops to damp washed hair, applying it to the mid lengths . I've kept my usage to about 3 drops and only not he very tips of my hair as I just don't feel my mid lengths need it. The oil is easy to distribute and doesn't make my hair feel slick at all. I can't say that i feel my hair is being 'repaired' but it does seem to have made the ends softer and smoother. Another way I've been testing this oil out is by dabbing it along my hairline where my scalp and get a little dry and flakey and although this isn't a recommended use its been working wonders for me. Just one or two drops every now and then and I've definitely seen improvement, I even think my baby hairs are growing a bit more due to it, but I can't be certain. The second method of using the Hallelujah Hair Oil that is recommended is the Intense Hair Reboot. The method requires two to three full pipettes worth of oil to be applied to the hair and left overnight. I'll admit that this seemed a little scary to me, I really thought it would be hard to wash out the next day but surprisingly it was quite easy to remove with my regular shampoo. This method hasn't grabbed me, while my hair felt very silky afterwards and has that lovely shine I like it was also a little flat and hard to style. I definitely prefer the less full on approach with this oil. I'm going to continue to experiment with this oil, so far I've enjoyed it and haven't had any major problems with it and the added shine and delicate fragrance on my hair is definitely a bonus. I think for a brands first product, it is quite the triumph especially as it is also 100% organic certified by not only Soil Association but COSMOS Organic also! That is pretty impressive. You can tell a lot of time and thought and care has been put into Forest & Shore as a brand, the Hallelujah Hair Oil is very high quality and at £10 for 50ml (£14 100ml) it is very affordable. The packaging is beautifully done, decorative and modern without any wasteful filling or gimmicks, using recyclable cardboard and glass. 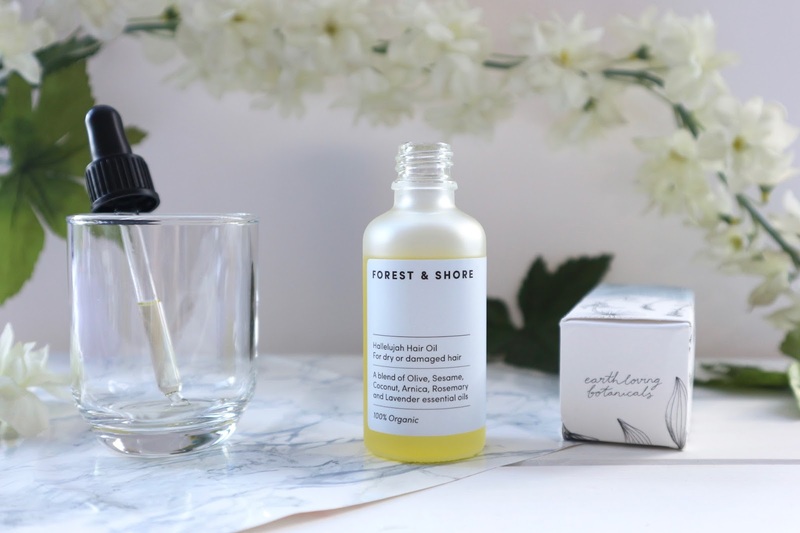 I'm pretty interested to see what product Forest & Shore launch next! The Forest and Shore Hallelujah Hair Oil is free from: Parabens, Sulphates, Mineral Oils, EDTA, Silicones and Synthetic Fragrances and Colours. Vegan and Vegetarian Friendly and Not Tested on Animals. Haven't tried this before though it's sounds pretty nice. And very affordable, must check this out.